An airplane cleaner who was arrested on charges she pocketed nearly $15,000 worth of contraband from planes grounded in New York City has been fired. A spokesman for AirServ said Saturday that Juanette Cullum's employment with the company "was terminated." Cullum was arraigned Friday on charges of grand larceny and criminal possession of stolen property. 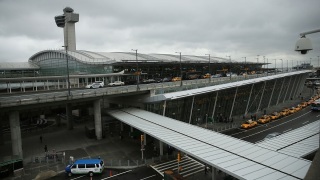 A witness told American Airlines security officials that the 48-year-old Brooklyn woman was stealing property at John F. Kennedy International Airport, according to a spokesman for Port Authority of New York and New Jersey Police. Detectives interviewed Cullum and searched her apartment, finding 1,429 bottles of unopened liquor, seven iPads, two laptops, 19 Kindle tablets and toiletries, the spokesman said. It wasn't clear if Cullum has an attorney who could comment on the charges.